A former special investigator at the presidential office accused Cheong Wa Dae of dereliction of duty as he appeared before the prosecution Thursday for questioning over his spying claims. 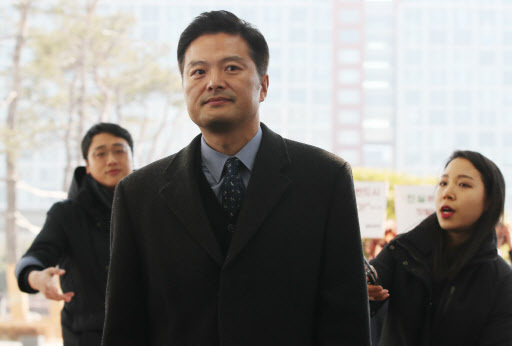 Kim Tae-woo, who was dismissed from Cheong Wa Dae and returned to his original post at the prosecution, was questioned about allegations that his superiors at the presidential office had instructed him to surveil civilians and former bureaucrats for political reasons. “I have performed my duty as a member of the special inspection team under this administration to follow orders from superiors,” Kim said in front of the Seoul Eastern Prosecutors’ Office. The presidential office has said it never carried out surveillance of civilians or drew up blacklists of people critical of the government. Kim also accused a presidential secretary for anti-corruption, Park Hyoung-chul, of revealing classified information to protect an acquaintance. Controversy erupted after Kim told the media last month that he had been unfairly punished for reporting bribery allegations involving a high-ranking official close to the administration. Kim was reassigned to his original post at the prosecution last month over suspicions that he had sought to influence a police investigation of a corruption case involving one of his acquaintances. Cho Kuk, senior presidential secretary for civil affairs, and Blue House chief of staff Im Jong-seok said at a parliamentary steering committee meeting Monday that Kim holds a grudge against the presidential office because of his dismissal. Key officials, including Cho and Im, filed complaints against Kim and three other officials for leaking to local media outlets classified information that he had collected while working as a special inspector between July 2017 and November 2018. President Moon Jae-in took power after Koreans took to the streets for months, demanding the ouster of former President Park Geun-hye. Park was implicated in a string of crimes, including systematic surveillance against cultural figures critical of her government.